Road trips are about so much more than merely traveling from Place A to Place B, and often it's the small things that linger in the memory. One of the best food memories from a recent trip comes from an early dinner at the South Fork Public House in Pullman, WA. When dining in an unfamiliar locale you could a) randomly choose a spot by interesting name or signage, b) cruise the downtown or nearby mall and look for restaurants with full parking lots, a sign that it's popular with the locals, c) skim Yelp reviews, or d) ask the hotel's front desk staff for recommendations. We asked. We scored! 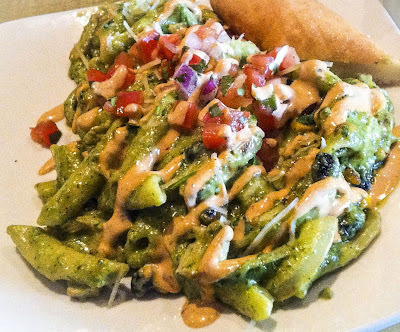 South Fork Pub and its Cilantro Pesto Pasta sounded appealing for a late lunch/early dinner after our 285-mile drive and a few photo-shoot stops. 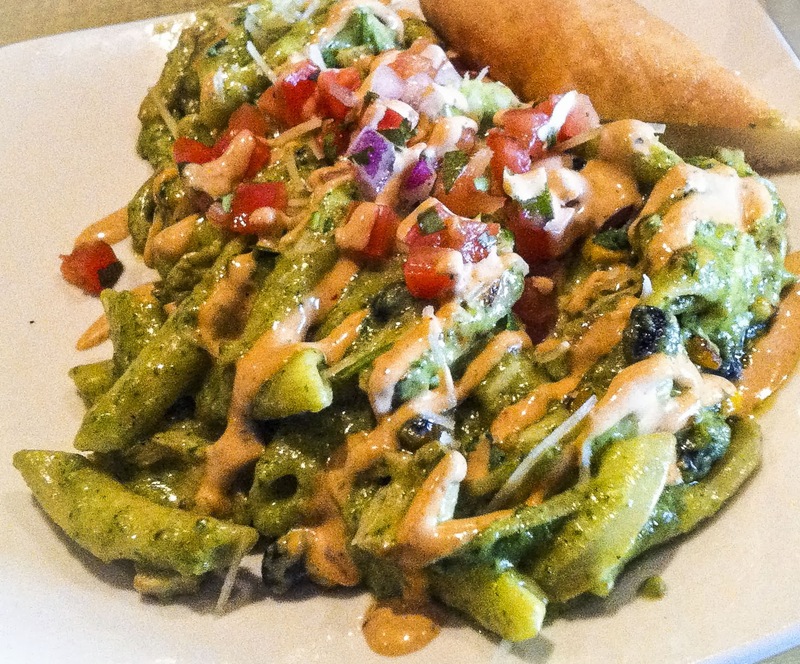 Cilantro Pesto Pasta - Penne pasta tossed in a cilantro pesto with chicken, black beans, corn, sauted peppers & onions, and salsa fresco. 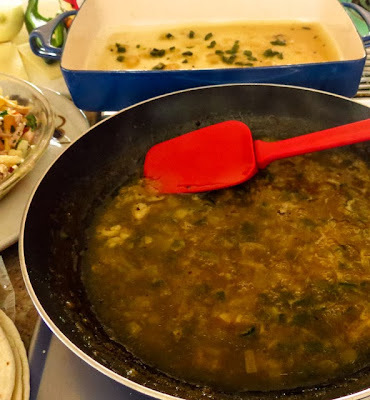 Cilantro was a dominant flavor in the creamy pesto sauce, as you would expect, but the fresh, bright notes of the salsa added a sufficient contrast to provide balance to the dish. 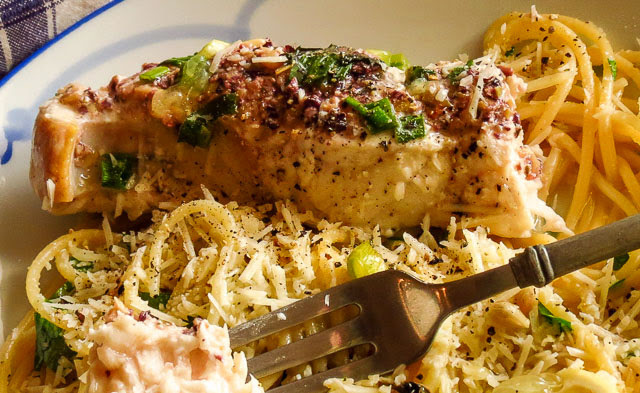 Cilantro-haters won't order Cilantro Pesto Pasta, but the rest of us shouldn't miss it. The photo above shows a half-portion of the entree, plated by the accommodating kitchen. We loved every forkful we ate, and still had enough left over to enjoy the next day. That's a lot of pasta, enough for really hearty appetites! Lentil Chili - Thick and hearty house-made chili made with ground beef and pork, Andouille sausage, and Palouse Brand Lentils. 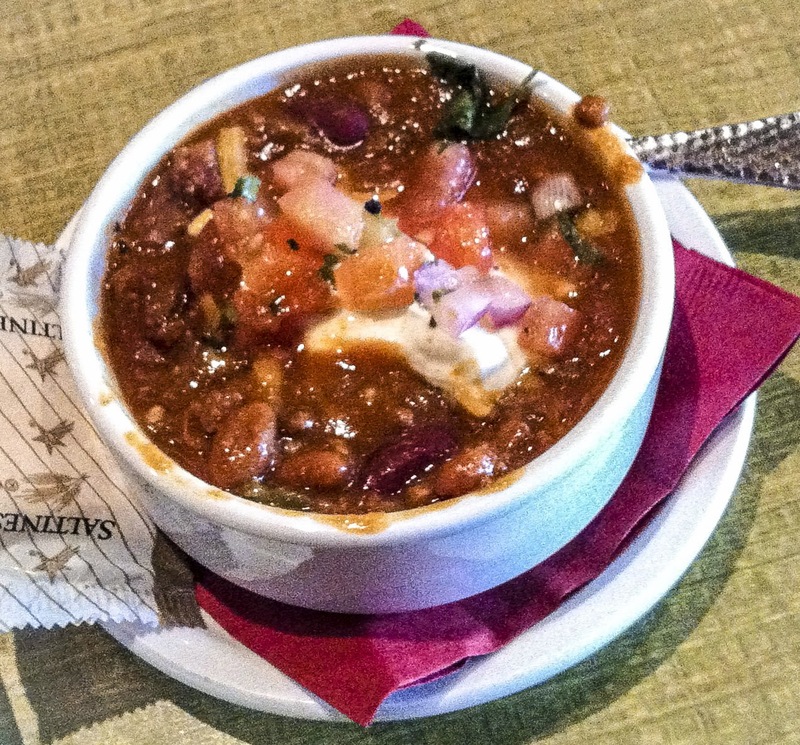 I'm a committed chili fan and love to sample new recipes everywhere we travel - culinary research of a sort. Lentil Chili sounded...well, odd, beyond my experience tasting or cooking, so I cautiously ordered a small cupful. My mistake, I should have ordered a bucketful of this amazing concoction. Definitely not vegetarian, the trio of meats provided a rich, deep, background flavor for a mellow blend of spices and chiles. Beans and lentils?! Don't get me started on the Beans vs. No-Beans regional debate. Here in the Palouse Country it seems beans belong in chili and lentils are welcome additions to the pot. It works. This is damned fine chili and I'd return again for this dish alone. 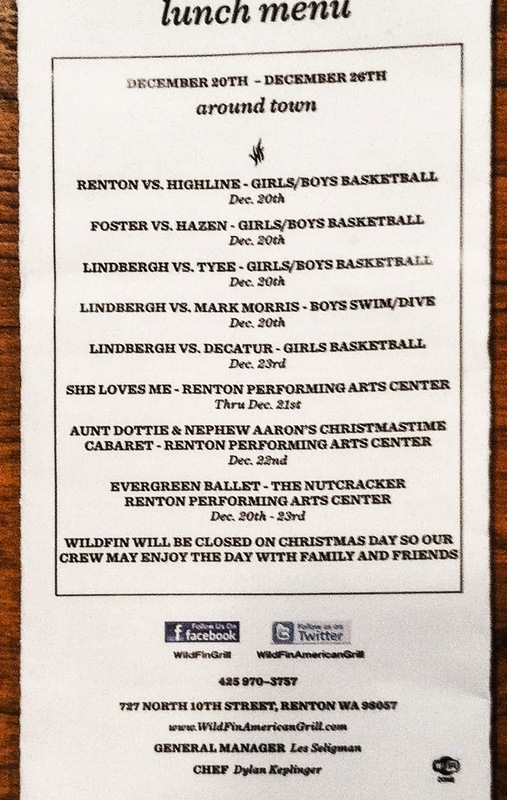 What were we thinking, driving to a major shopping center on a busy Saturday, the weekend before Christmas?! This was not about holiday shopping, not your typical seasonal shopping run. Nope, RL we had an emergency. We absolutely, positively, needed printer ink. That need sent us to The Landing, a medium-sized shopping center in Renton, hoping with fingers crossed that it would be less crowded than some of the other malls in the area. Hah! the parking lots were jammed, the stores crowded, and the people looked "focused". Mission accomplished with minimal fuss and reasonable lines, but it was lunch time and we had earned a reward. 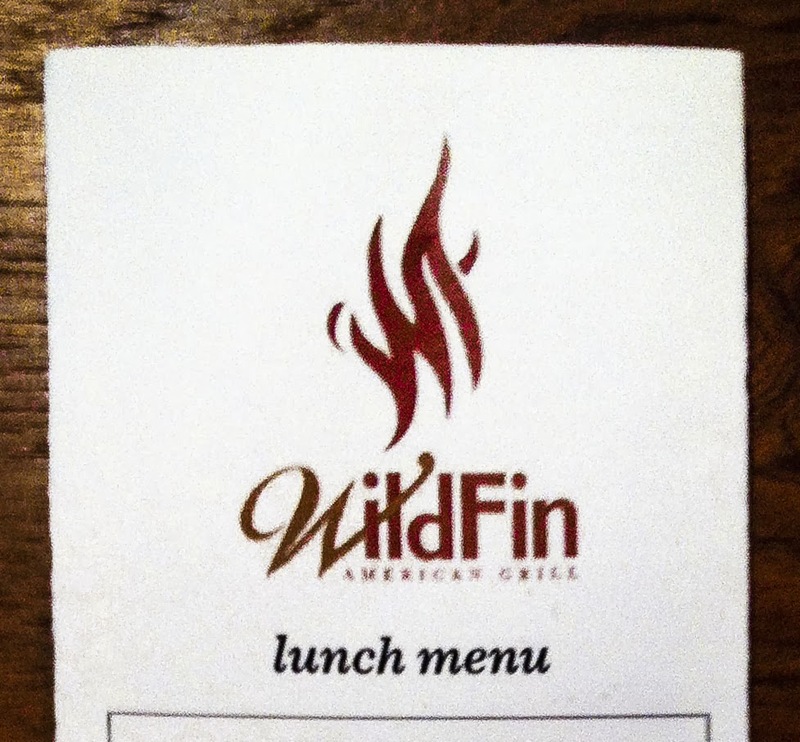 We took the opportunity to enjoy lunch at Wild Fin American Grill, a new-to-us eatery at The Landing. Good choice! The decor was oddly interesting, with large graphics of cows, assorted poultry and a moose (I think) adorning the walls. 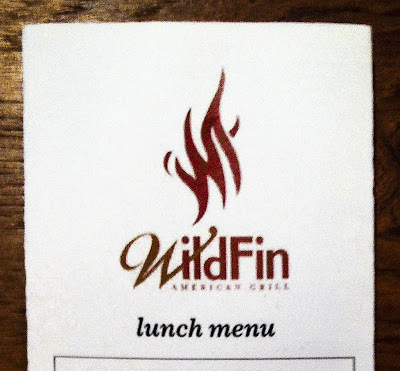 WildFin, what's up with the barnyard motif? Moving on... I sipped a warming Hot Toddy while studying the menu, a perfect beverage to counter the chill of a damp Winter Solstice afternoon. It was odd to have a teabag, spoon and dish of honey plunked down alongside the mug of lemony hot water and booze. No problem, I was up to a DIY challenge and actually enjoyed having the honey available to adjust the sweetness level. Check out the cover of the 3-fold paper menu for the week, a listing of local sporting and cultural events. That was a friendly welcome-to-the-neighborhood touch. The lunch menu was challenging with too many tempting choices. I couldn't decide between a dozen or so items, and that was my short list of choices. Skim WildFin's online menu and you'll see the problem. 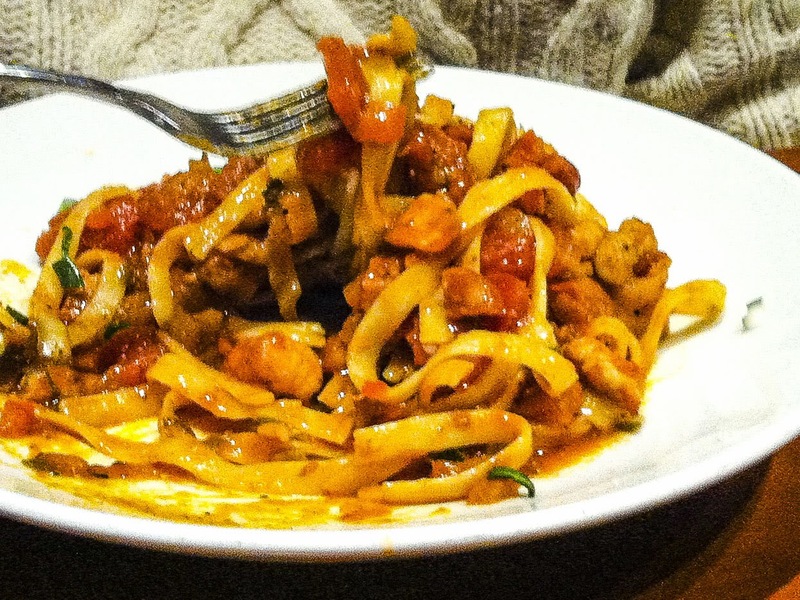 RL ordered the New Orleans Fettuccine, a large plate of pasta with ample chunks of Andouille, shrimp and chicken scattered throughout. The jambalaya sauce was sensational, spicy but not overwhelmingly so, and the seafood cooked perfectly. The portion was large enough to serve two, so RL enjoyed it reheated for Sunday lunch. Indecision was my issue, not uncommon when I face a large and appealing menu. I took the easy option and went with a choose-your-favorite lunch combination. 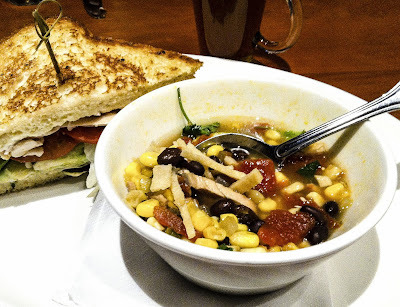 A cup of Smoky Chicken Tortilla Soup and half a Smoked Chicken Club Sandwich were good choices but more than filling. The soup stole the show, one of the best versions I have ever tasted. Yes, better than my own recipe so I need to up my game! The broth was smoky, tangy with lime, spicy but not hot, and packed full of veggies and large pieces of tender chicken. I wish I knew the spice combination that provided the back notes. The club sandwich was quite good, but totally overshadowed by that delicious soup. While I'm not usually a fan of desserts at lunch, the Salted Caramel Bacon Popcorn Crunch Sundae did sound intriguing. How many sweet, salty, crunchy, boozy and smooth ingredients can you pile on?! The menu states the adult version comes with Grand Marnier, Godiva Chocolate liqueur and brandy. Now that's some combination! I'm already plotting our return visit, reviewing the lunch menu again and again to select my next entree. Tuna Tacos with mango mint salsa? Shrimp and Cheese Grits? Cougar Gold Chili Prawn Mac & Cheese? The Appetizer Tower with stacked crab, prawns & artichoke dip, calamari and clams? Sausage & Mushroom Flatbread? Sigh, and I haven't even skimmed the dinner menu yet! - a savory SouthWest version of the classic. Sourdough Surprises selected popovers as the December 2013 baking challenge. Sourdough and Popovers? This was a surprising pairing. I hadn't baked or even thought about popovers in ages, and certainly never with sourdough starter in the ingredient mix. This would be "interesting". 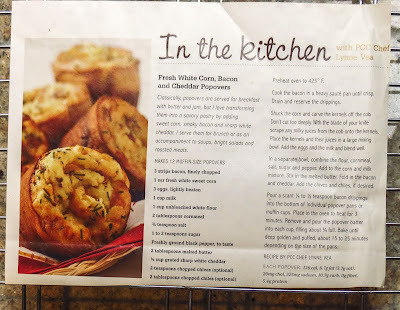 A King Arthur Flour recipe was referenced but my inspiration came from two other sources; an online post here followed by a recipe in my local food co-op newsletter. 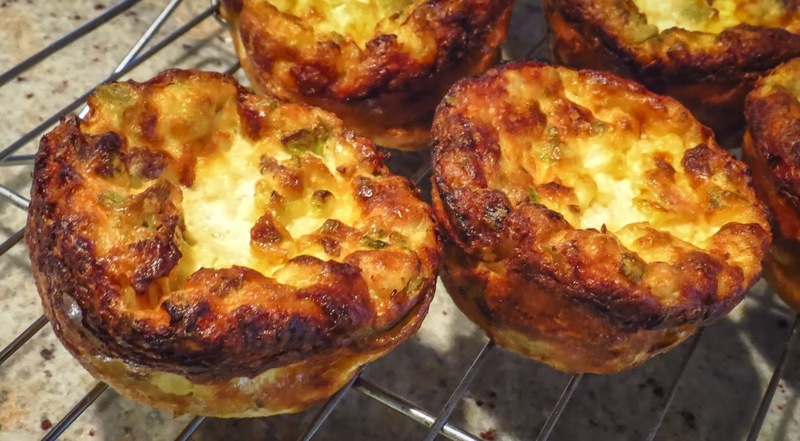 Both offered a different take on savory popovers packed full of southwest flavors. 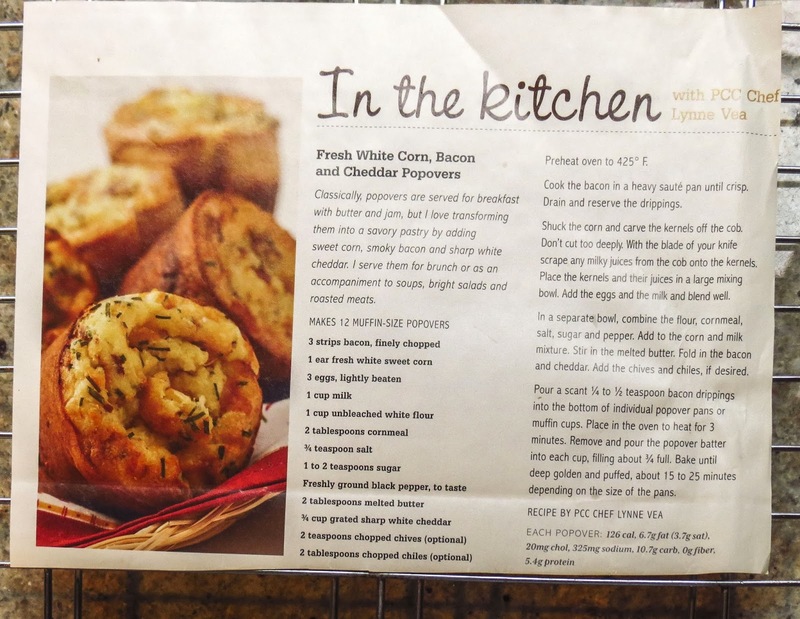 Oh yes, these recipes called my name. It is impossible to resist bacon, cheese and chiles in anything. The results were surprising, definitely tasty but not quite what I had expected. These were not the everyday popovers I had attempted before, those towering, airy wonders that totally collapsed as they exited the oven. No, this sourdough variation delivered less puff and more egg, resembling a light, savory custardlike pudding encased in a thin-shelled pastry. I sampled one bite of the outer crust and then nibbled the soft, flavor-packed center. Forget the fork, I pulled the remaining crust apart and ate it with my fingers... every crumb... piece by piece. Mmmmm, I loved that delicate, crispy edge. Recovering my manners I returned to the fork to finish the moist center of that first popover, and then ate a second one. Even RL, not usually an egg enthusiast, enjoyed two popovers. 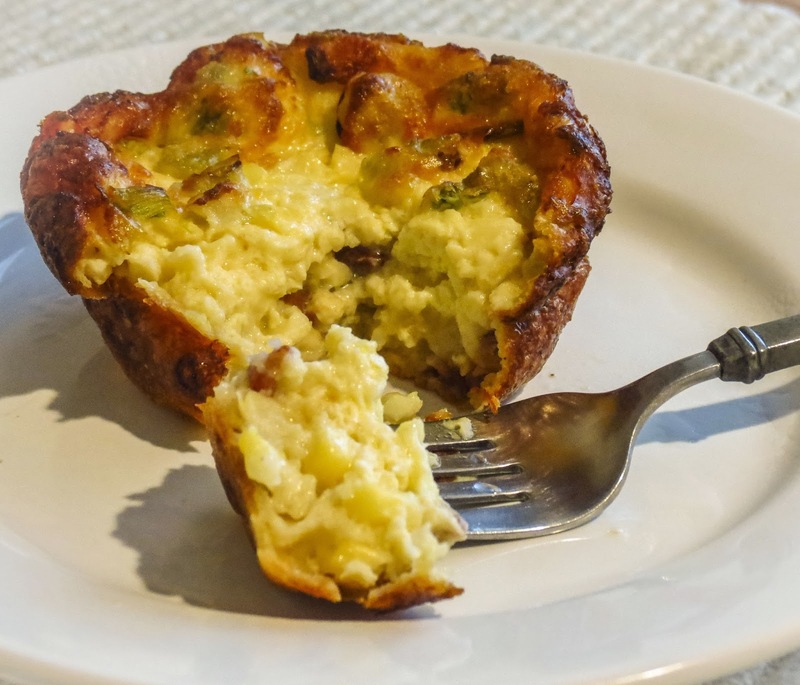 Lighter than a quiche or frittata, but more dense than a traditional popover, this Loaded SW Popover was a new crossover wonder. Thanks for the popover challenge, Sourdough Surprises. 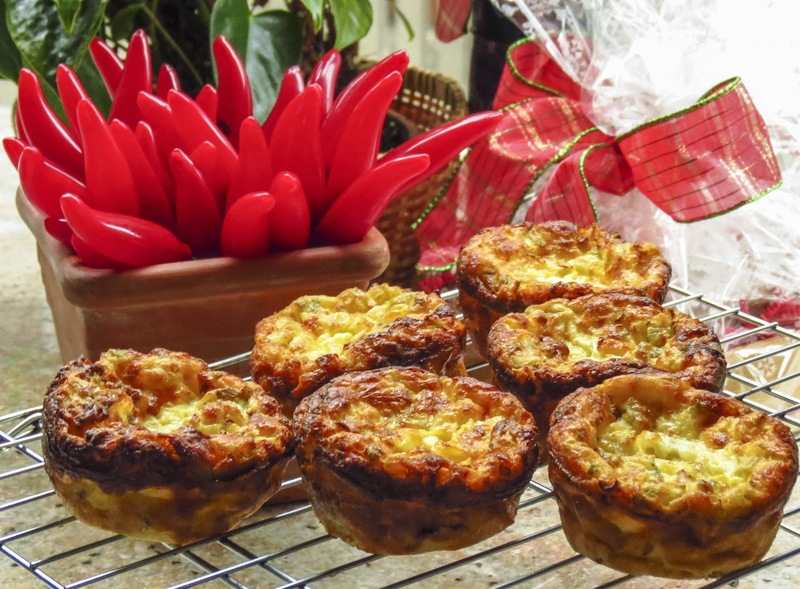 2 tablespoons diced chiles (canned or fresh, adding more or less as you like), tossed with a light sprinkle of flour to keep them clumping and diving directly to the bottom of the muffin cups. Move a baking shelf to the bottom third of the oven. Preheat the oven to 425 F.
Place the corn in a second, larger mixing bowl. Add the beaten eggs, milk, and sourdough starter; blend well. Add the dry mixture to the wet mixture and stir to combine. 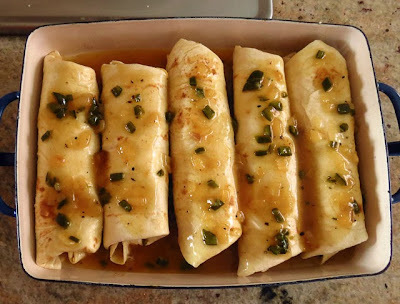 Add the melted butter and mix. Fold in (fold in, not whisk in or beat in) the bacon, cheddar, chives and floured chiles. 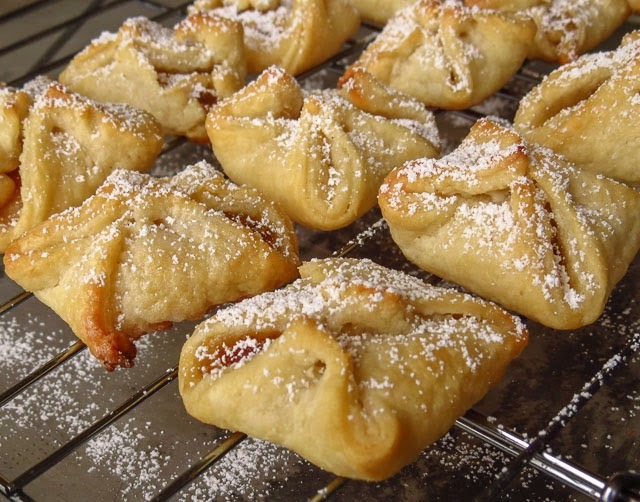 Use 2 muffin tins and plan to fill alternate cups with batter. Place 1/4 to 1/2 teaspoon bacon drippings in the bottom of alternate muffin cups. 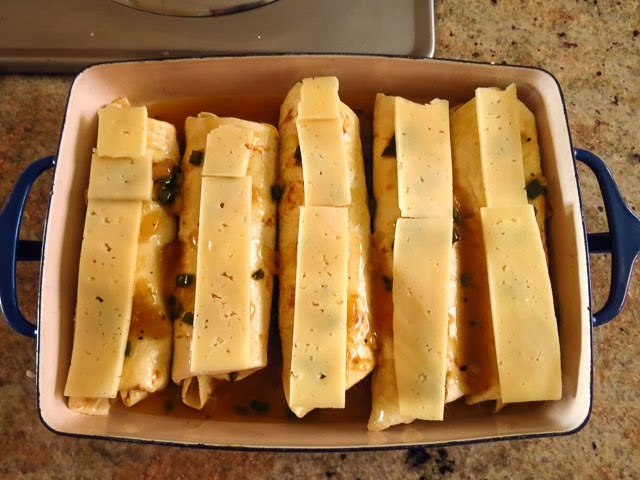 Place in the preheated oven to warm for 3 minutes (any longer and you'll have smoke alarm issues). Remove and quickly pour the popover batter over the heated bacon drippings in those cups, filling about 3/4 full. (Optional suggestion found online: Pour a little hot water, less than an inch, into each empty muffin cup to avoid warping the pan.) 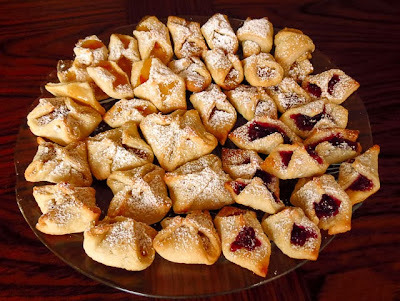 Bake until puffed and a dark golden color, approximately 15-20 minutes for regular size and 20-30 minutes for Texas size. 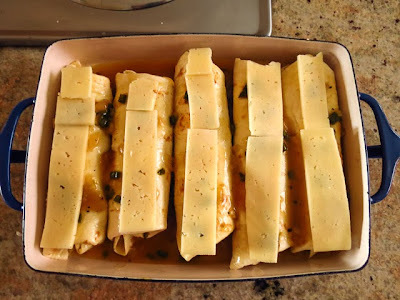 Remove from the oven and place on a baking rack to cool for a minute or two. 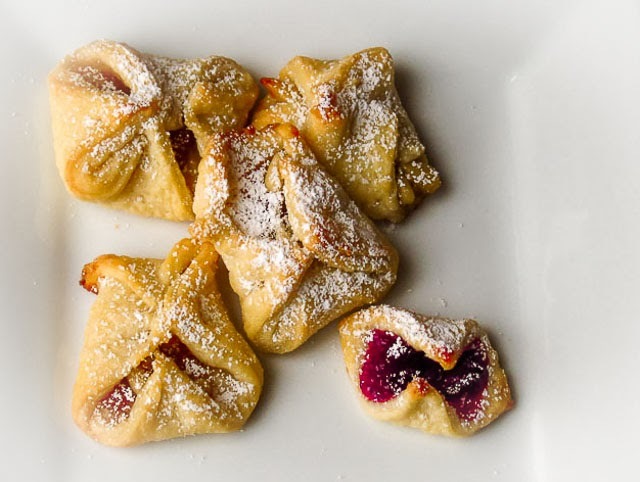 Run a butter knife around the edge of each popover to loosen, tilt in muffin cup or remove to a backing rack for a few minutes to set up a bit. Serve when still quite warm. Cook's Note: Next time I will try using a blender, whizzing up half of the onions and chiles with the wet ingredients and stirring in the rest by hand. Chicken salad is ubiquitous, or so it seems. Recipe ingredients may vary widely but there's a lot of chicken salad happening across the country. 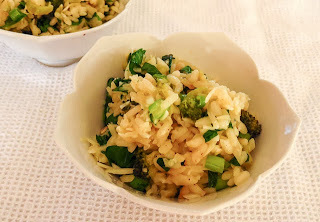 It's the "little black dress" of salads, simple but ready to be dressed up or down with accessories depending on the occasion, the accompaniments and the presentation. Chicken salad is terrific as a salad, but it's also a versatile filling for bite-sized appetizers or heartier sandwiches. This week it paired especially well with Green Onion Biscuits. 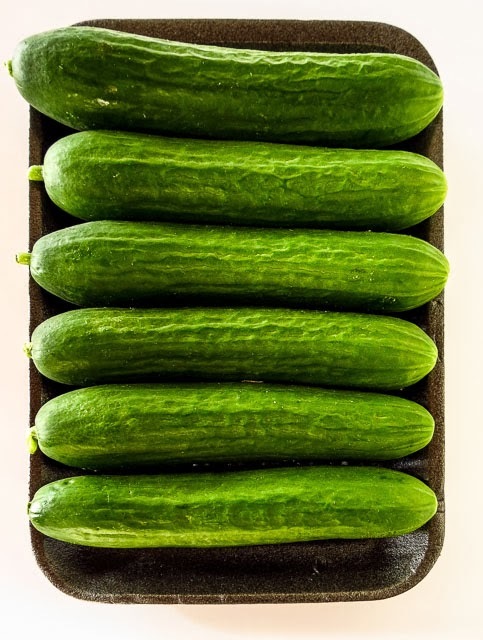 Just imagine the salad's creamy, mellow dressing playing off the contrasting textures of grapes, pecans and celery; the blend of sweet honey and tart lemon juice or zest; the flavor pop from curry, cumin and fresh herbs... oh my! 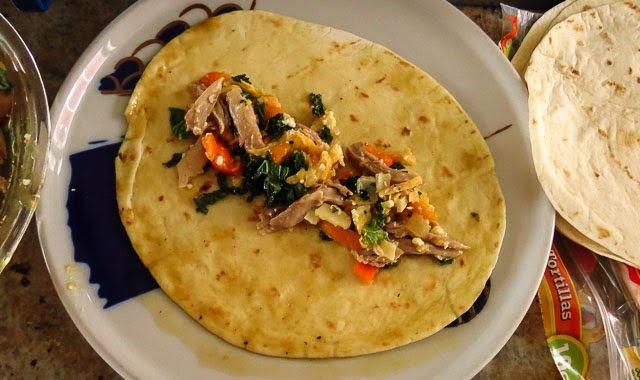 All of that plus moist chunks of chicken contained in a savory biscuit - now that makes for a flavor-popping bite! 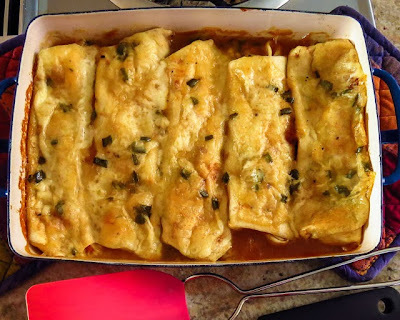 My Secret Recipe Club assigned blog for December was Angelas Kitchen, an amazingly rich resource for gluten free/dairy free recipes and tips. 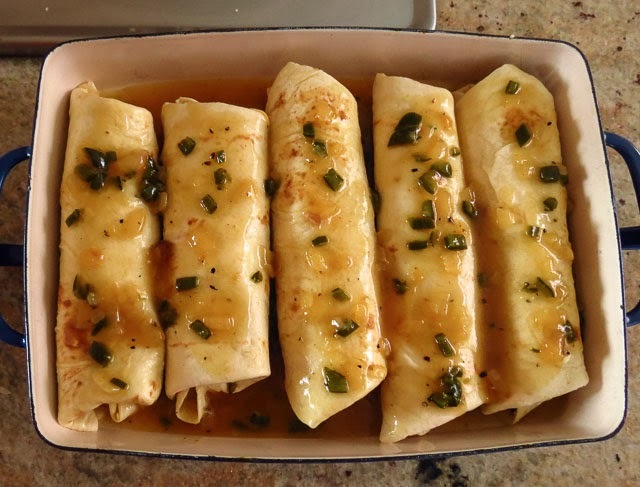 In the past few weeks I have prepared several of Angela's recipes, some as written and others adapted for our non-bf/df kitchen; delicious both ways! 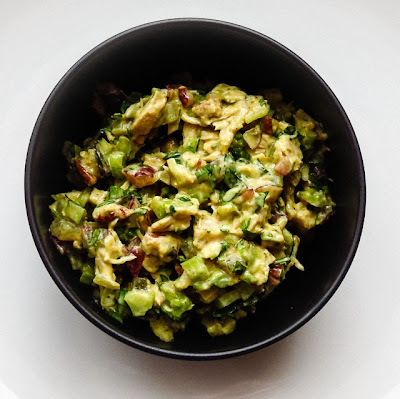 I'm sharing my non-gf/df version of her curried chicken salad recipe, but also recommend Angela's Almond Quinoa with Asparagus and Mushrooms, Spinach Burgers with Mint, or Coconut Lime Chicken. Take some time and explore Angela's Kitchen, you will enjoy meeting her as well as gaining a wealth of information about the gf/df approach to cooking. Mix together mayonnaise, hot sauce if using, honey, curry powder, cumin, salt and pepper, and minced cilantro or parsley until blended. 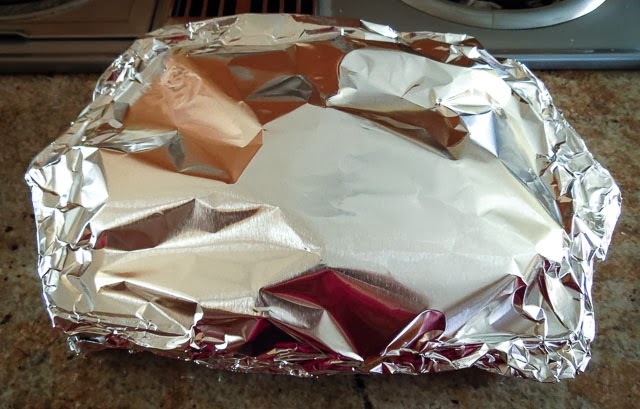 Refrigerate until ready to dress the salad. Place the chicken, celery, pecans, green onions and red grapes into a bowl, add the mayonnaise blend and mix until evenly distributed. Taste and adjust seasonings. It's true, I have a weakness for boules… baguettes… breadsticks… biscuits… rolls... and most other savory breadlike things. Who can resist any of these baked goods when they are homemade and fresh from the oven? 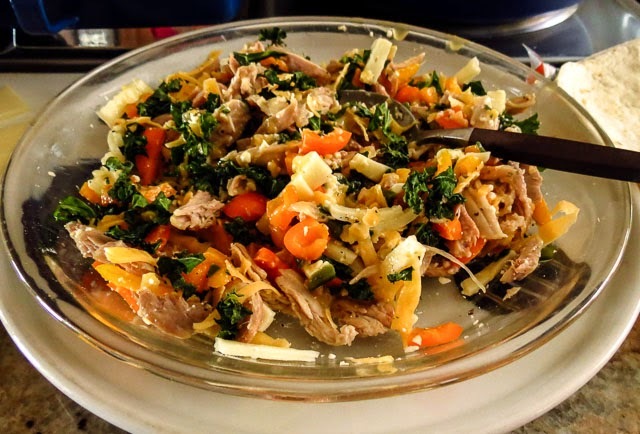 As the tantalizing aroma fills the kitchen, its easy to anticipate the taste, the crunch, the soft, airy interior. 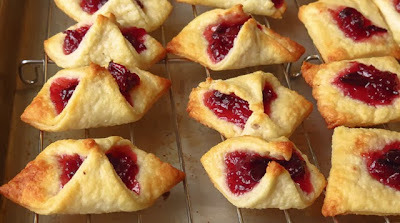 I've been known to scorch my mouth sampling a biscuit as soon as it left the oven. 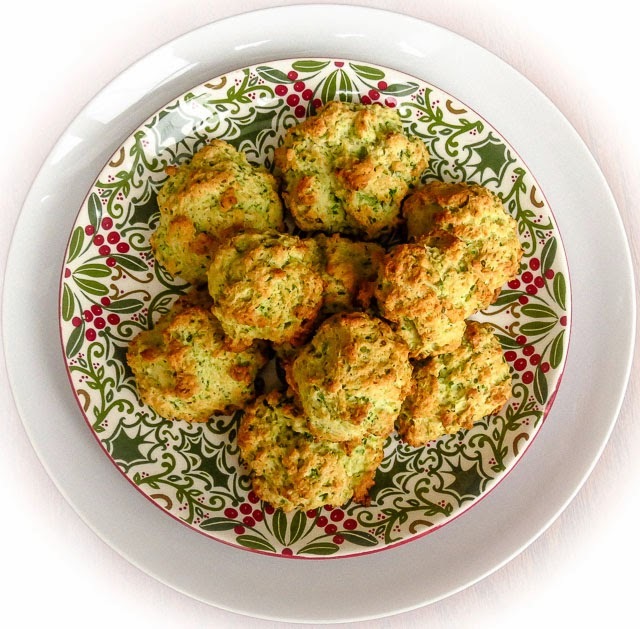 No drama today, just a fine batch of Green Onion Drop Biscuits, a new-to-me recipe that is worth repeating. For years Parmesan Puffs have been my "go to" favorite for savory, one-bite biscuits, all crunchy on the outside with soft and melty interiors. They are dangerously addictive and never last long enough to worry about leftovers. But, they weren't quite what I needed this week. Today's Green Onion Drop Biscuits came about from a need to pair with - well, I'll fill that in in my next post, an SRC Reveal on Monday next. 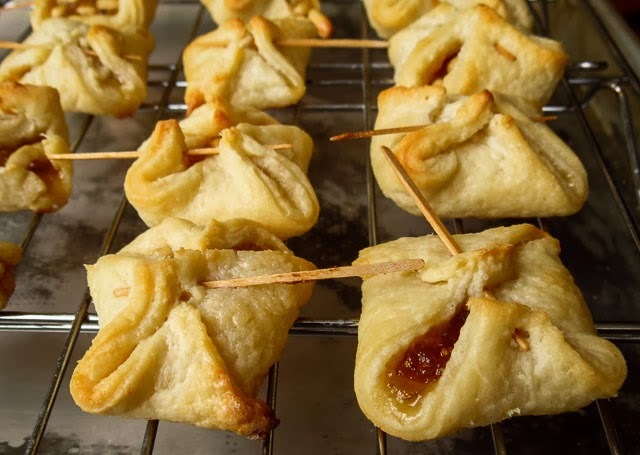 Just know that this recipe produces a tasty savory biscuit with a firmer interior, a crumb that can stand up to dunking or hold a moist filling. Check back in a few days to see them put to good use… the ones we didn't devour today. 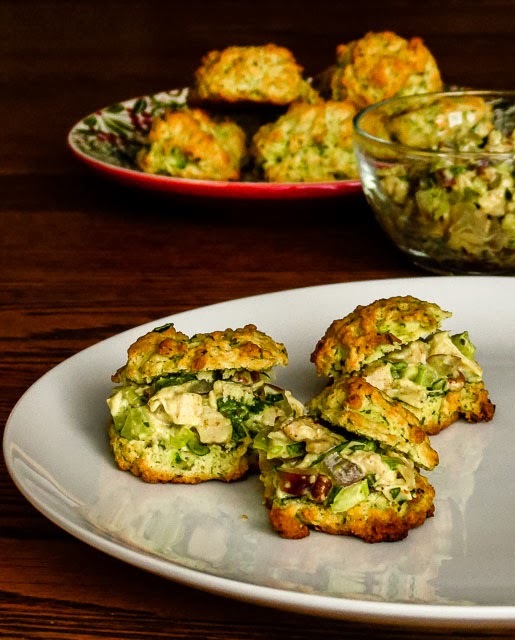 Update: Curried Chicken Salad made a delicious filling for mini versions of these Green Onion Drop Biscuits. The biscuits will be just the thing to serve with a steaming bowl of borscht tomorrow; I'll add a scattering of dill weed and skip the hot sauce in the dough. Use a sieve and sift together into a bowl the first 5 ingredients, flour to white pepper. 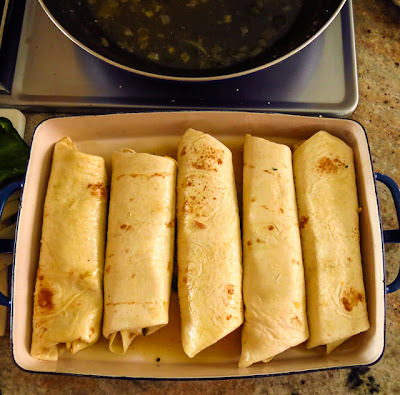 Add the butter and incorporate until you have a mealy texture. 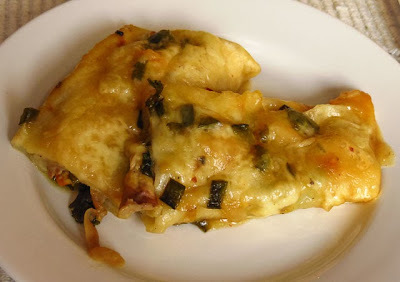 Stir in the green onion, yogurt and hot sauce if you are using; mix just enough to have the soft and sticky dough just comes together. Divide the dough into 6 portions and drop by heaping spoonfuls onto a silpat-covered baking sheet. Bake on the middle shelf of a preheated 425 F oven for 12 to 15 minutes, until lightly golden brown. 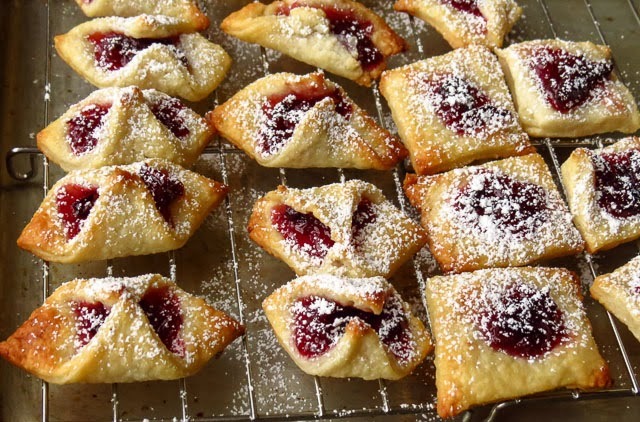 (Note: If you choose to make 9-10 smaller biscuits, they will require much less oven time) Be careful not to over bake or the biscuits will be rock hard and dry after they cool. 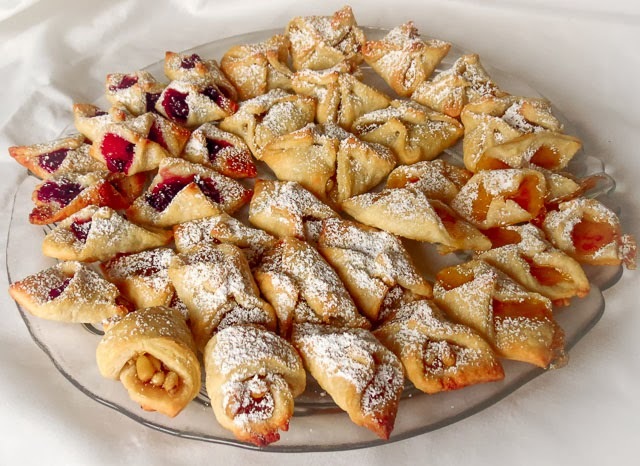 Eat while still warm to enjoy them at their best. Brrrrrr, baby it's cold outside! We bundled up for an early evening stroll and carefully crunched our way along snow-covered docks and shoreside walkways to the Riptide Pub. I warmed up with a hot toddy and the Capt sipped a cup of tea before dinner, enjoying festive holiday decorations and the cheer of the nearby fireplace. Mmmm, that hot rum toddy was tasty enough to repeat. Today the sun is out but it's still cold outside. While this isn't the midwest, bone-chilling kind of cold, the weather dudes predict the recent Arctic Blast will hang around well into next week, keeping temperatures below zero (celsius, of course, since we're in Canada). That's reason enough to enjoy more hot toddies, though I'm partial to this apple cider version. 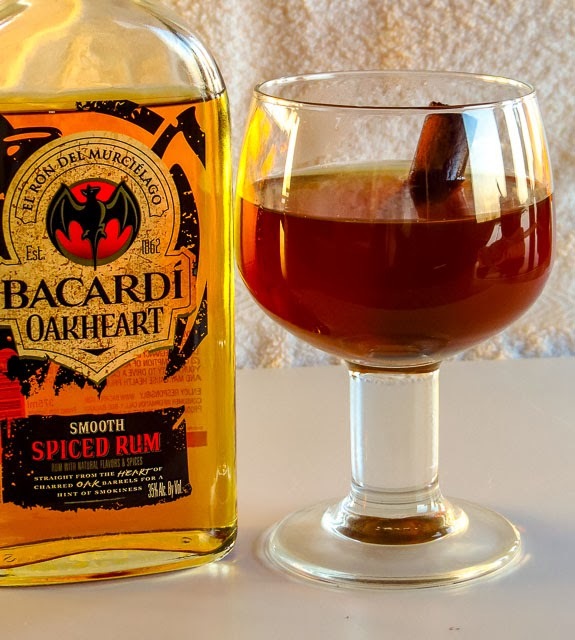 I recommend either Captain Morgan Spiced Rum or Bacardi's Oakheart, my latest favorite. Try it, you'll like it, even if your weather isn't all that cold. 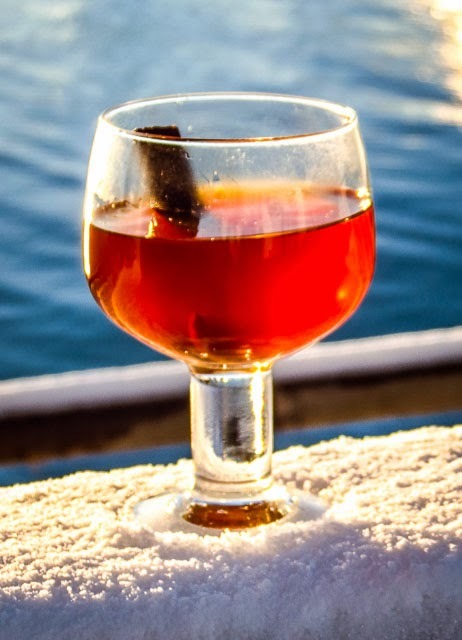 Coat the bottom of a glass mug or cup with the honey; add the rum. Heat the cinnamon stick, cloves, orange peel and cider in a small pan over medium heat; let simmer and steep a bit. 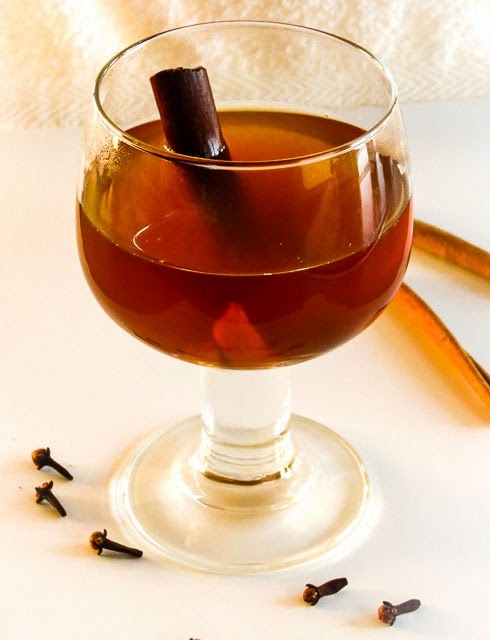 Pour the heated cider over the rum, stir with a cinnamon stick and serve. 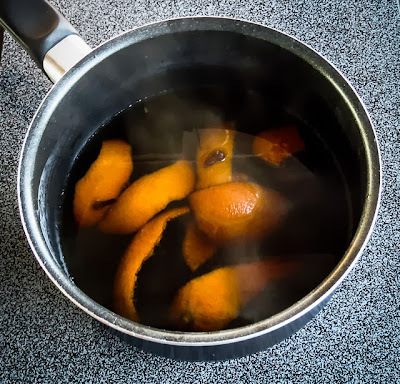 Garnish with the cinnamon stick if you like… I'd rather leave it in the pan and heat more cider for another toddy or two. "Awake before dawn" sounds dramatic, but it's routine when sunrise is scheduled close to 8:00 a.m. This morning the hours before dawn felt unusually quiet, with none of the usual waterfront sounds filling the air. The color outside the windows felt wrong, much too monochromatic gray. No wonder, an inch of snow covered everything and the flakes were still coming down. The snow didn't stop falling all day. I grabbed the camera after a light breakfast and set off to explore this unexpected winter wonderland. Hmmm, the ramp was my first challenge, not so much steep as very slippery. 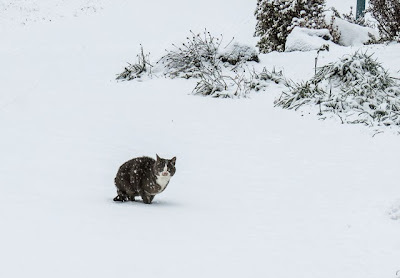 A handful of local feral cats looked quite unsettled, lifting one paw then another to shake out the crusty snow clumps as they waited for the Kittycare Crew to come by with breakfast. I wandered about the waterfront for an hour before the cold finally penetrated my jacket, seeped through the soles of my boots, chilled my fingers through my gloves, and nearly turned my cheeks and nose into lumps of ice. Enough of this fun! 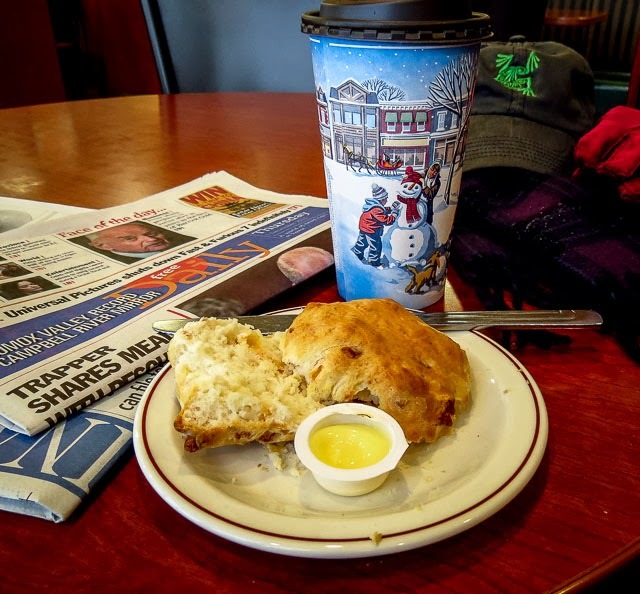 Across the busy Island Highway a Tim Horton's Restaurant beckoned to me, promising a warm interior with hot drinks and good company to save me from freezing any vital parts. The restaurant was warm, the company was terrific (good to see you N), but next time I will know better and order tea, just tea, instead of a vanilla latte and scone. The latte was overwhelmingly sweet with a heavy hand on the odd vanilla flavoring and the scone was cold and quite dry. It must not have mattered since I ate every crumb and sipped away at the drink for over an hour. 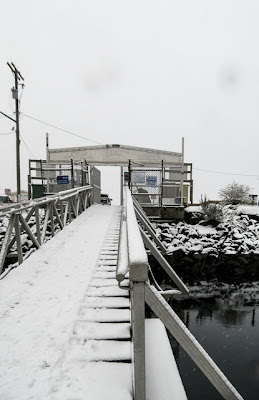 Warmed and cheered by good conversation I trudged out once again into the falling snow… after N drove me back to the marina... meandered back to the boat and heated up a bowl of chili verde for lunch. Now I wonder where the dozen or more waterfront cats are curling up to stay warm in this weather. 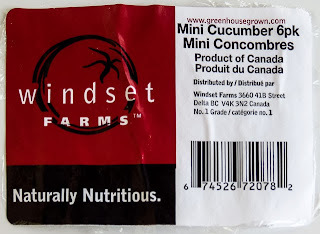 Today at the grocery I was surprised to find small, pickling-sized cucumbers… mini cucumbers, available in December! Checking the label I found they were grown in Delta, BC greenhouse, perhaps in one of those multi-paned buildings we motor by enroute to the boat. Does that make them local vegetables, even if not quite not seasonal??? Acres of new commercial greenhouses keep popping up along our route from Seattle to the Tsawwassan Ferry Terminal. 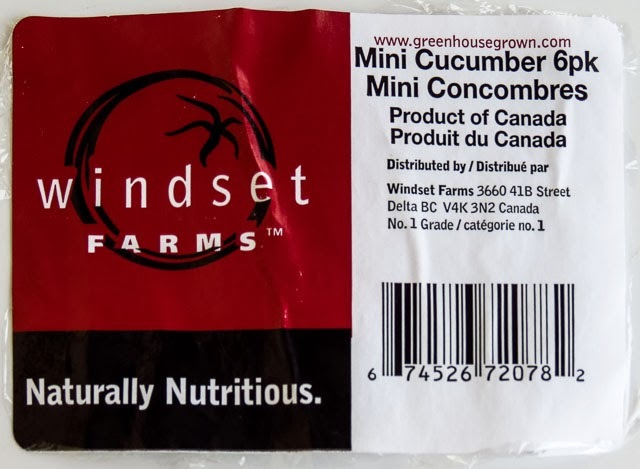 Delta, B.C., located just north edge of the USA-Canada border, has long been known for its year-round "greenhouse grown in B.C." tomatoes. 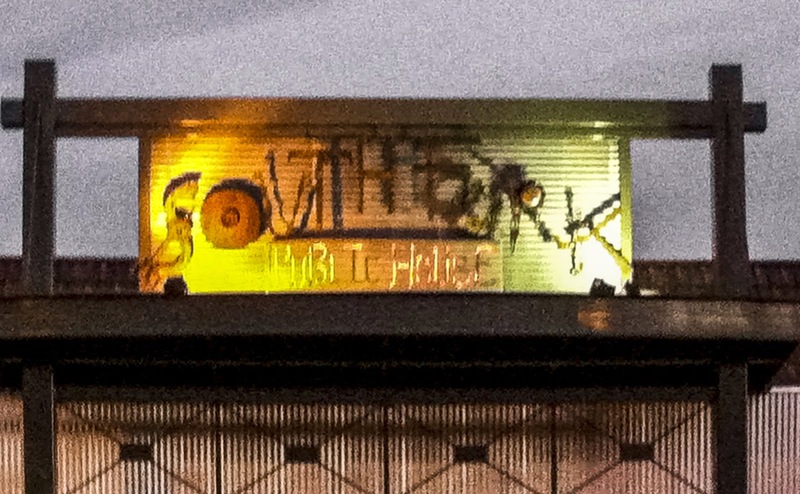 Lately we have noticed more and more of these structures along Highway I-5 on the Washington State side of the border. I wonder if all of this glass-enclosed acreage is used exclusively for vegetables or is some space dedicated to flowers? Just curious, I might need to check this out in the future. Hmmmm, what to do with these mini cukes? 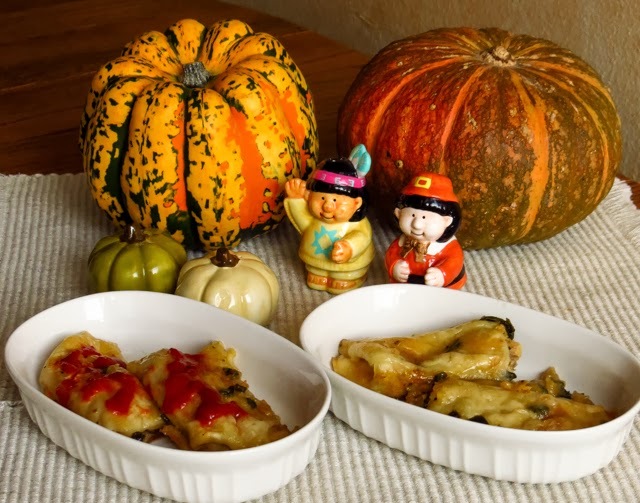 We enjoy Quick Bread and Butter Pickles, and Japanese Sunomono Salad was another possibility. 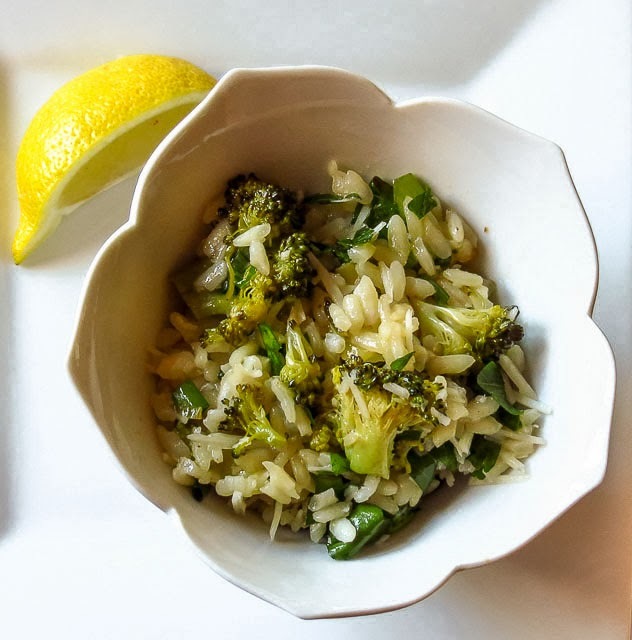 Easy decision, a package of six little veggies offered the opportunity to enjoy familiar recipes and still try something new. That something new was Cucumber Wrapped Tofu with Dipping Sauce. Well, new to me, though I'm certain there is a recipe online somewhere. 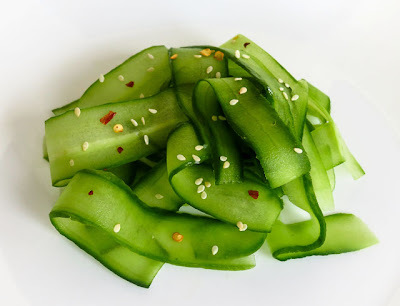 I played with the notion of quick-pickled, sunomono dressed, cucumber noodles combined with tofu for a more filling dish. This was cute packaging, but the appeal was much more than visual. 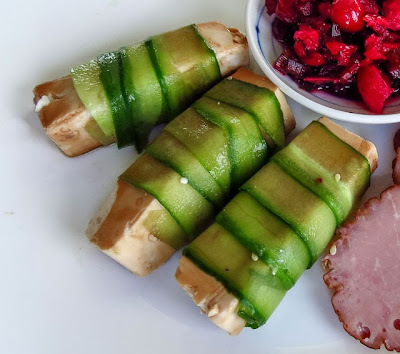 The tofu bundles' light, bright flavor was an instant hit at lunch today, and would work equally well as an appetizer or a bento box addition. 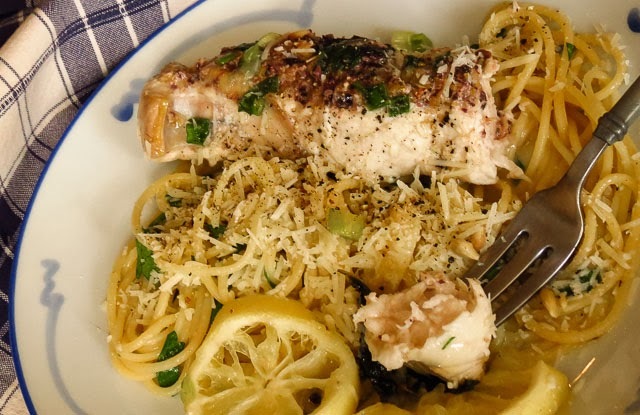 Two thumbs up on this versatile dish - it's a keeper. Below is the procedure I followed rather than a list of specific measures, so experiment and enjoy. Use a vegetable peeler to cut long cucumber ribbons and toss them with a sunomono-style dressing. 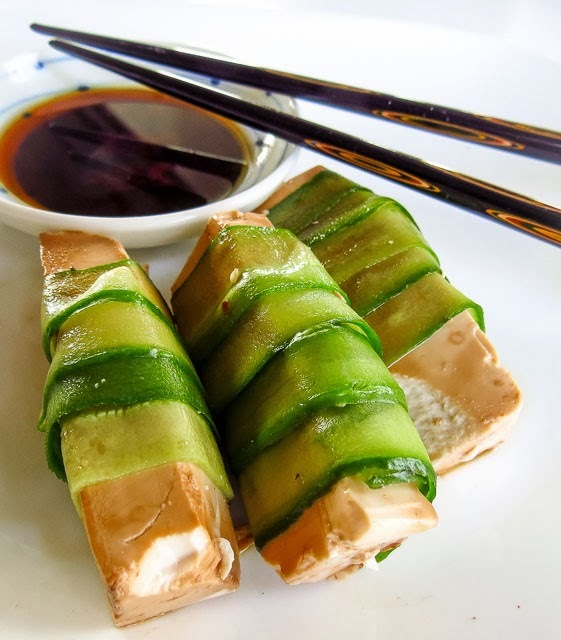 Sprinkle soy sauce over long batons of firm tofu and wrap them with the cucumber ribbons. 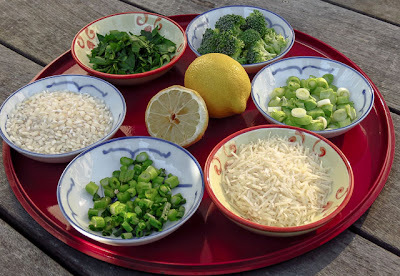 Serve with a dipping sauce mix of Ponzu and seasoned rice vinegar to add one more flavor note to the party.